Produktinformationen "TETRIX™ Motor Encoder Pack"
DC Motors. 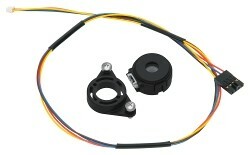 The kit includes one motor shaft encoder, one shaft encoder cable, an encoder mount, and assembly instructions. Intended for use with the TETRIX PRIZM® Robotics Controller or with the HiTechnic DC Motor Controller, it enables users to program motors using both rotation and degrees. Features 360 cycles and 1,440 pulses per revolution. Weiterführende Links zu "TETRIX™ Motor Encoder Pack"
Kundenbewertungen für "TETRIX™ Motor Encoder Pack"